Sheila Forler Bauman, a graduate of the University of Western Ontario has been working in the Physiotherapy profession for thirty years. After ten years of work experience in the public sector, Sheila decided to pursue her dream of owning/operating a physiotherapy clinic in her home town of Elmira. She opened Woolwich Physiotherapy in 1993 , at its first location in downtown Elmira. Outside of work, Sheila is an enthusiast of hiking, canoeing, kayaking, fitness classes and all things ‘foodie”. Sheila’s primary area of practice /interest is in Orthopadics, with a special interest in Sport Physiotherapy. She holds a Certificate in Sport Physiotherapy and has worked extensively with a wide range of sport organizations, including The Elmira Sugar Kings Hockey Club, Skate Canada, and Wheelchair Basketball Canada. She is presently the lead physiotherapist for the National Women’s Wheelchair Basketball program, with whom she has had the privilege of attending Beijing 2008 and London 2012 Paralympic Games. 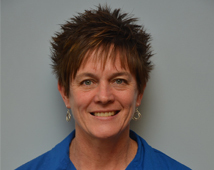 In addition to her clinical practice, Sheila has been an instructor in the Kinesiology program at Wilfrid Laurier University, in the area of Sport medicine, for the past twenty years.